Catering Management Book from C.H.I.P.S. Michael Roman in his catering career has produced everything from box lunches to corporate galas serving thousand! In his consulting and teaching career, he has helped hundreds of catering businesses and some of the nation's largest hospitality companies. 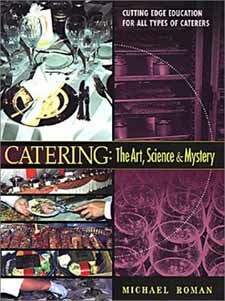 Catering: The Art, Science and Mystery is a practical, hands-on guide. Professionals and newcomers to the catering business will find this book an excellent reference and training tool.